Four renovated halls in the Tutankhamun gallery in the Egyptian Museum in Cairo have been unveiled. 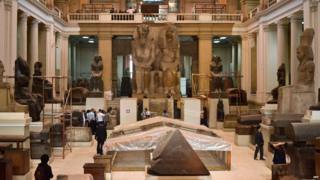 The renovation is part of a seven-year project to refurbish the entire Egyptian Museum. The halls, opened by Prime Minister Ibrahim Mahlab, house treasures from the tomb of the boy king which were unearthed in 1922. It was one of the most significant archaeological discoveries of the 20th Century. Tutankhamun's tomb had been untouched for some 3,000 years until the British archaeologist Howard Carter found it after years of fruitless excavations. The renovation of the museum is being aided by funds from the European Union and other international donors, AFP reported. James Moran, who heads the EU delegation in Cairo, said the EU gave support to help to boost Egypt's tourism sector whose "revival... is fundamental for the economy". The EU, he told AFP, would offer 92,500 euros ($115,000, £73,300) next year to help renovate the eastern wing of Tutankhamun gallery. The museum houses approximately 160,000 objects covering 5,000 years of Egypt's past. •Thought to be the son of Akhenaten, known as the "heretic king"